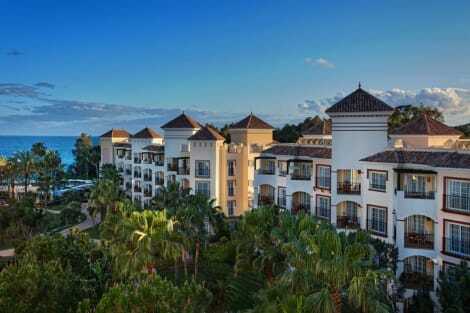 The eco hotel and bungalow complex are located in Estepona. Public transport departs from stops located just 800 m, restaurants are also to be found within a similar distance. Countless shops, the beach and the sea are within 1 km of the hotel. The centre lies about 3 km away Málaga Airport is roughly 70 km away. Renovated in 2003, this hotel comprises 21 rooms and 21 bungalows. The hotels facilities include a 24-hour reception, 3 kiosks, 2 different shops, a car park, a kids' club and 5 playgrounds. Dining options include 3 bars, 3 cafés and 2 air-conditioned à la carte restaurants (children's highchairs available on request). Guests may also make use of the medical services. The welcoming and cosy rooms come with a hydromassage bath or shower/WC, a direct dial telephone and satellite/ cable TV. Further fittings include a fridge, double bed, individually regulated air conditioning and central heating as standard. The hotel offers guests the opportunity to try their hand at archery. Guests may select their breakfast and midday meal from an ample buffet. Lunch may also be chosen from a menu. Furthermore, there is the opportunity to book an all-inclusive stay. Enjoy a satisfying meal at El Rincon serving guests of Macdonald Villacana Club Resort. Quench your thirst with your favorite drink at the poolside bar. Make yourself at home in one of the 90 air-conditioned guestrooms. Complimentary wireless Internet access keeps you connected, and satellite programming is available for your entertainment. Conveniences include safes and desks, and housekeeping is provided daily. With a stay at Marriott's Playa Andaluza in Estepona (New Golden Mile), you'll be within a 10-minute drive of Puerto Banus Marina and Puerto Banus Beach. This beach apartment is 8.6 mi (13.9 km) from Marbella Old Town and 6.3 mi (10.1 km) from Selwo Adventure Park. Make yourself at home in one of the 60 air-conditioned rooms featuring kitchens with refrigerators and ovens. Rooms have private balconies. Complimentary wireless Internet access keeps you connected, and satellite programming is available for your entertainment. Conveniences include safes and desks, and housekeeping is provided on a limited basis.